The Goal Alignment Diagram for PowerPoint is a useful illustration of the strategic management process. 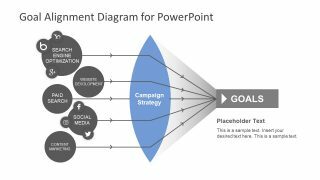 It is a two-slide PowerPoint marketing plan template to discuss the campaign strategy. This template of goal alignment is an effective presentation for digital marketing. At this age of technology, almost all the businesses and organizations use the internet as a marketing tool. Every new company creates their website, Google and social media presence. Because the internet is now an effective platform to get clients and customers. The customers have an easy and quick access to relevant information of the company. It includes the company’s product, core values, and contact details. Therefore, the template is suitable for business marketing consultants. They can use the goal setting PowerPoint diagram to demonstrate marketing strategies. The slides contain simplified visuals to illustrate company’s online marketing objectives. 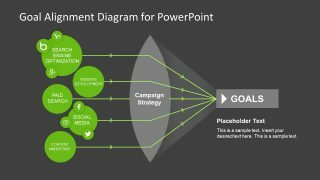 The Goal Alignment Diagram for PowerPoint shows five major factors involve in digital marketing campaign strategy. These factors help achieve company’s goals through a planned set of activities. The PowerPoint of goal alignment enables a business to ensure teamwork to achieve similar outcomes. 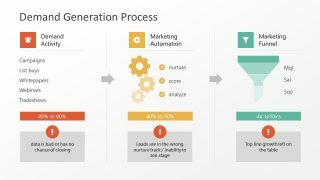 The PowerPoint diagram of goal alignment displays five digital marketing factors on the left side. These are the interdependent logical workflow processes. Such as search engine optimization, website development, paid search, social media, and content marketing. 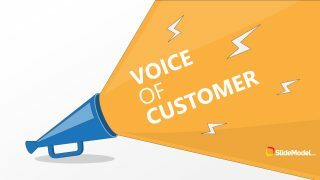 The campaign strategy and objectives vary from business to business and industry vise. Therefore, every business requires a unique strategic plan to successfully achieve its objectives. 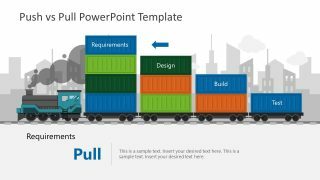 The diagram of Goal Alignment here explain the digital PowerPoint template for internet marketing concepts. All the factors are equally important as they contribute towards the same set of goals. 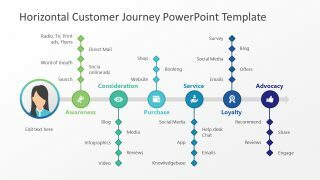 Overall, the goal alignment for PowerPoint enables the company to map its business strategy diagram. Hence, template simply demonstrates the company’s objectives with experiment goals. It may involve many process improvements to get desired results. A digital marketing template is also an assessment tool. Therefore, the PowerPoint template can assist in presenting the industry surveys. It can also suggest the area of focus for the consumer market.